Swing Plane Perfector attempts to take some of the confusion out of swing plane practice by providing consistent visual feedback in a sturdy, portable device. The engineer took up the challenge and between the two of them the Perfector was born 9 Months later. Although the gestation time was the same as a human embryo, the Perfector is a whole lot quieter at night. Adjustable for any angle to facilitate individual’s height and length of clubs. On grass utilizing lawn spikes. Designed for fitting to driving range mat. Free standing using alignment sticks. Completely portable. Fits into golf bag pocket. The company offers perhaps the best explanation of how the Swing Plane Perfector works and its application in the video below. 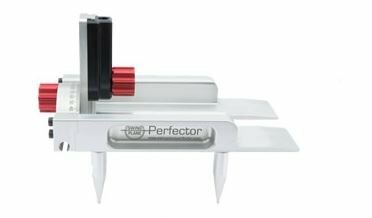 The Swing Plane Perfector (SPP) comes packaged neatly in a box, much like a mobile phone or other electronic merchandise. The packaging was a surprisingly nice feature that compliments the product inside. In hand, the SPP is a heavy, machined piece of metal that is both modern in appearance and extremely sturdy. 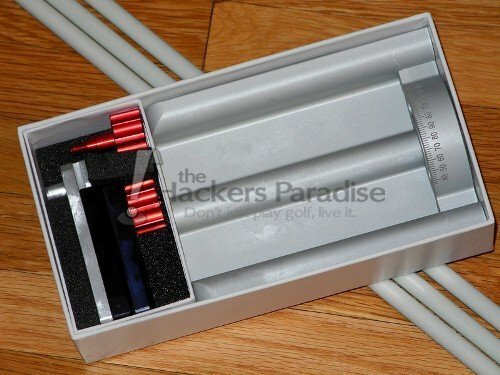 Included in the packaging were three alignment rods, also quite heavy and sturdy. At its core, the SPP functions very similarly to simple alignment sticks set at an angle behind a golfer. However, it offers some features that just an alignment stick can’t offer. First of all, the SPP offers a level of precision and consistency that isn’t really paralleled elsewhere. The adjustment dial allows the golfer to set the alignment stick at angle that will match every club in the bag. In addition, it can be used both on the grass and on a hard surface with a golf mat. Due to unfriendly late fall weather, the SPP was tested indoors with a 48” x 48” mat. 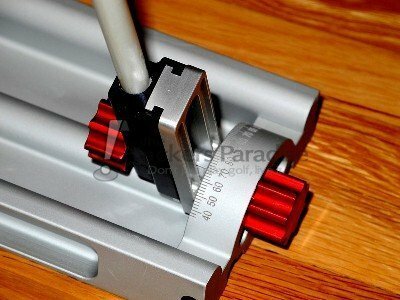 Fortunately, it was designed to accommodate this need, something that a simple alignment stick cannot do, since hard floors are impenetrable. 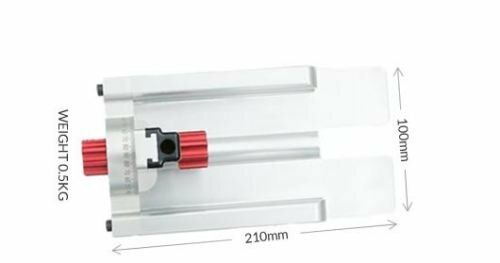 By inserting an alignment rod perpendicular to the target line in the channels machined on the bottom of the device, the SPP was perfectly sturdy during use on a concrete floor and the flat lip fit snugly under a mat. The video above recommends finding a person to stand at the rear to ensure that the alignment rods and golf club shaft are both at the same angle. As an alternative, knowing the lie angle of the specific club being used and matching that number on the SPP’s adjustment dial worked as well. As mentioned earlier, the sticks included in the packaging are quite heavy (they seem to be made of a metal compound almost), very much unlike the cheap driveway markers many consumers use. In reality, they offered a level of intimidation at first that was somewhat unexpected, as coming into contact with them, especially at higher speeds, was quite unpleasant. That was a lesson learned quickly, but worth mentioning so others can avoid it. Testing showed the SPP was most valuable for work on the takeaway and backswing, providing a stern visual cue that helped prevent an inside takeaway. The benefit of the SPP over the ‘do-it-yourself’ method was the ability to quickly find the correct angle, match it to different clubs with consistency, and the compatibility with indoor use. Those looking for immediate feedback on the takeaway will find value in what the SPP offers. For this mid-handicap amateur, downswing work while using the SPP was best kept to partial or slow-motion swings. As noted, the heavy alignment rod was not the most pleasant thing to come into contact with at full speed, though regular practice would certainly diminish the chances of that happening. The Swing Plane Perfector proved to perform exactly as advertised. For amateur golfers, the question will be whether it offers enough benefit to justify the price. That’s a question that can only be answered on the individual level, but those that find interest should be glad to know that it’s constructed quite well, appears to be extremely durable, and works flawlessly for its intended purpose. A teaching professional would probably get the most bang for his or her buck, but it certainly has applications that could be useful to many golfers. 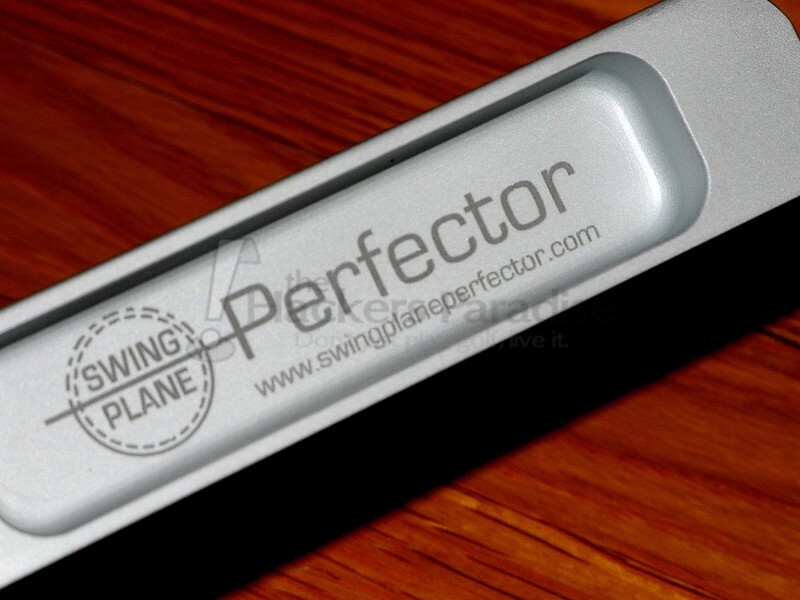 For more information, check out the company’s website at www.swingplaneperfector.com. 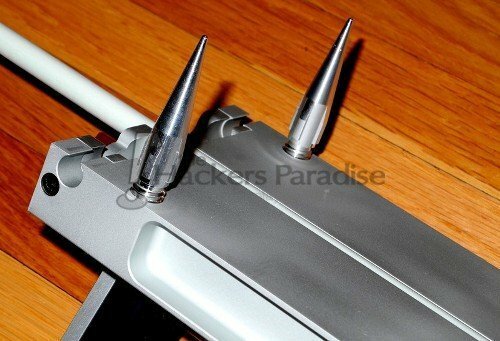 Sounds like a nice little practice tool for indoors or out. Especially with the nasty weather in the Midwest! Great review Ryan, it seems to be pretty expensive but it also seems to be very well made and does exactly what it is intended to do. I did find it very telling that the 2 testimonials on the home page were from coaches. Nice write-up, Hawk. Being able to use indoors and out is a nice feature and it looks easy to use once you get it setup the first time. Interesting concept which will no doubt help golfers like me who struggle with too much of an inside take away. I would like to try it before buying it. I really like this Hawk, but like you said, might be tough to justify the price. The durability is unlike anything you will find with cheap plastic, but those things only cost a couple bucks. 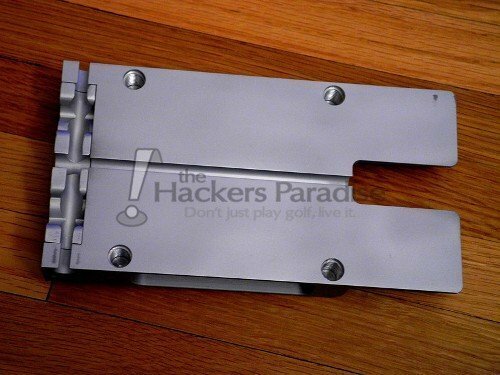 Looks like a good tool to make sure you take the club away correctly. An additional stick to correct an outside-inside downswing would make this even better and make it more appealing to me. It would be a nice aid to keep your muscle memory sharp during the winter since it works inside. $225 U.S.D. is pretty steep though. This is a brilliant review. I’ve just googled Swing Plane Perfector and watched a YouTube clip with Rick Shiels using it. Makes sense and answers a few of my questions. I’ve got so many areas of my swing that are wrong and far too much head movement. Hopefully this will sort. Swing plane perfector is really awesome. Golf Swing Plane Perfector to improve your skills impressively.